The new Duran Duran? asks Smash Hits of their cover stars The Power Station. 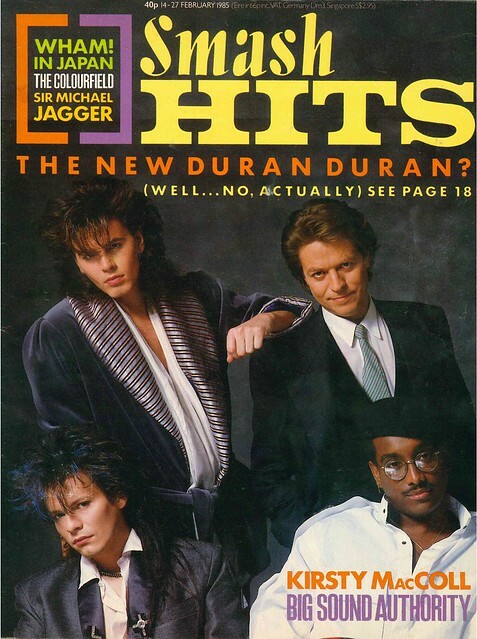 You may recognise a few Duran Duran faces in the band. 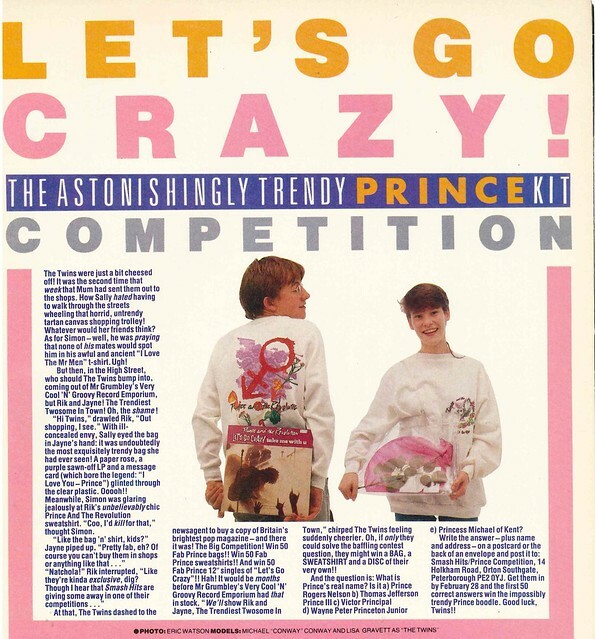 As you open the magazine, there is a poster of Paul King, the lead singer of the band King. 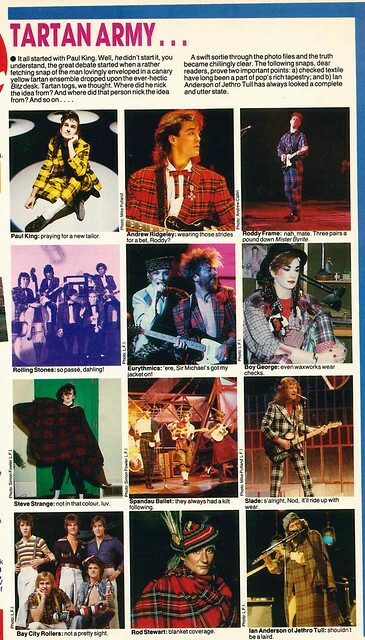 Smash Hits has noticed a recent trend in recent weeks, of stars such as Andrew Ridgeley, Boy George, Steve Strange and Eurythmics all wearing tartan. Pat Benatar is interviewed as she enters the final weeks of pregnancy. 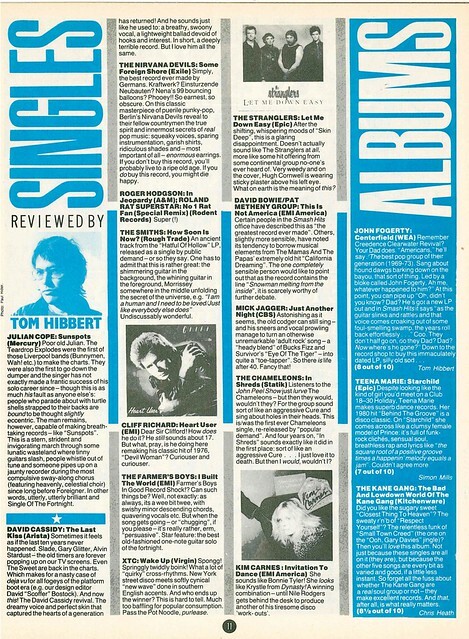 In Reviews, new singles by Cliff Richard, The Smiths, The Stranglers, Mick Jagger and Kim Carnes are all reviewed. Phil Collins is interviewed, where he reveals that John Taylor from Duran Duran is a fan of Genesis. Cover stars The Power Station get a three page feature. Wham! have recently toured Asia, and Smash Hits covers this with a two page photo feature. 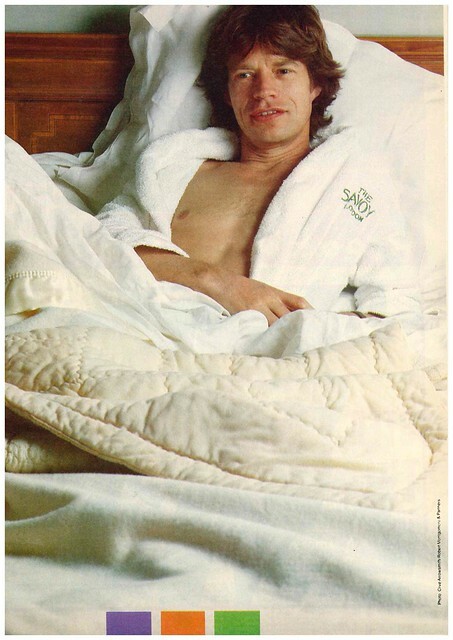 Mick Jagger gets profiled as he gets set to release his debut solo album at the age of 44, lying in bed in a hotel room when Smash Hits came to visit. 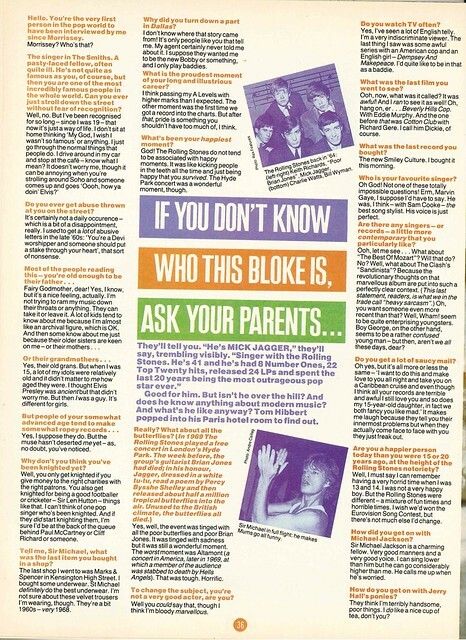 Terry Hall gets interviewed as he launches his third band (after The Specials and Fun Boy Three) The Colourfield, with the headline OLD MISERY GUTS IS BACK. 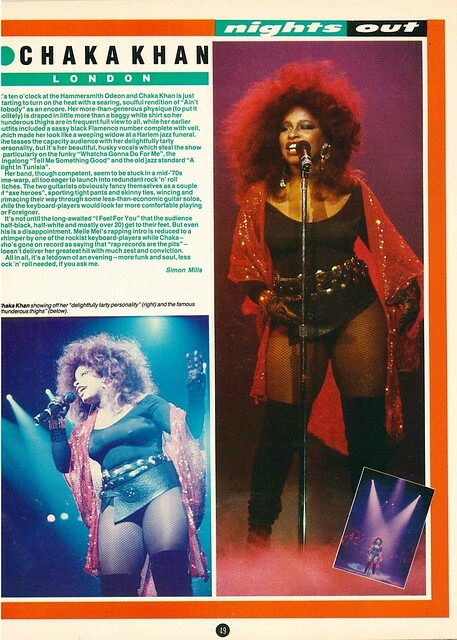 Concert Reviews sees Smash Hits go to see New Order and Chaka Khan in action. It was announced that Paul Weller is coming to Belfast in February next year. It’s the day after my birthday too. Wish me luck in getting a ticket for this, even though he was a grumpy arse the last time he was in Belfast. Apparently, there’s a thing called Manchester Day. It’s this Sunday. That sounds like an excuse for a Manchester themed chart. 57. 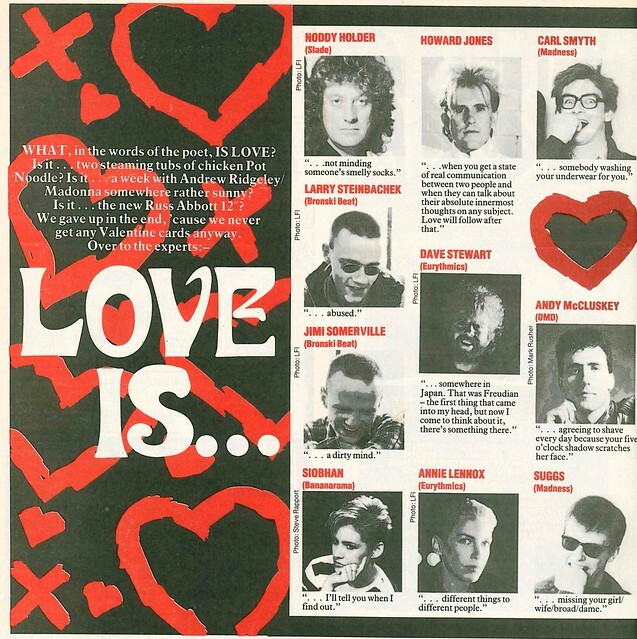 Cathal Smyth – Do You Believe In Love? After much confusion, Muse announced a gig at The Odyssey for April 6th. Thankfully, a bigger venue and much more notice than their Ulster Hall gig earlier this year. Hopefully, there’ll be a Belfast gig, and it won’t be like their Titanic Slipways one in 2012 that got cancelled joining Razorlight in Moira in 2011 as great Northern Ireland cancelled gigs. Today, tickets go on sale for Duran Duran’s tour in November/December. Unfortunately, there’s no Belfast gig. The tour begins in Manchester on Friday 27th November. If United were at home that weekend, i’d be making a weekend of it. Unfortunately, they’re away to Leicester City. Damm you Premier League Fixture Computer. So it looks like i’m going to be crossing my fingers for a Belfast gig to be announced later. If you’re reading this John, Simon, Roger and Nick – Spandau played Belfast this year. You don’t want Belfast folk to like Spandau more than you. Just saying. Talking of Manchester, last weekend was Manchester Day, so here’s five great things about Manchester. We begin this week, in 1981, with Vangelis, he of the epic sporting anthem theme. There’ll be another sporting anthem coming soon. 80s pop legend Glenn Hoddle celebrated a birthday this week. Just think what might have been if his football career hadn’t got in the way. I don’t care what anyone says, this is an 80s pop classic. I can’t help but wonder how many people bought this thinking Glenn and Chris were Glenn Tilbrook and Chris Difford from Squeeze. 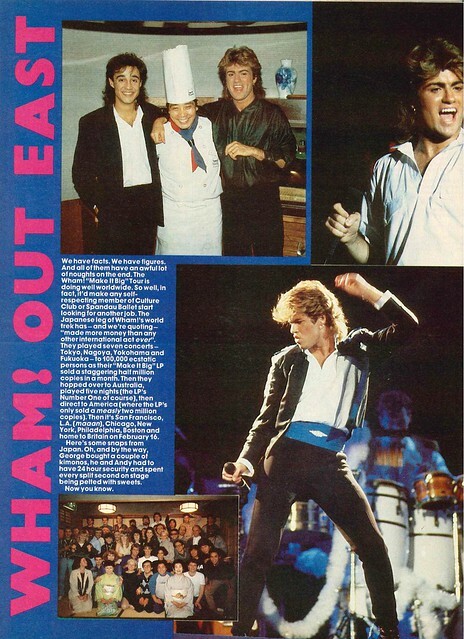 By that stage though, Glenn Hoddle was a TOTP veteran. Again, this is a brilliant song, and I don’t even support Spurs. The name’s Bon. Simon, Le Bon. Kelly Osbourne, fading to grey, hit the big 30 this week. We end, with East Kilbride’s finest musical export. Sorry, Roddy Frame. Hello and welcome to this week’s round-up from Top Of The Pops history, which features a tribute to a country. Neil Diamond turned 73 this week. One of his most famous songs might surprise you ……. or maybe not, as Red Red Wine, made famous by UB40 was a cover of a Neil Diamond song. Sharing a birthday, is TV’s Jools Holland, who believe it or not, was once a popstar as well, playing keyboards in Squeeze. 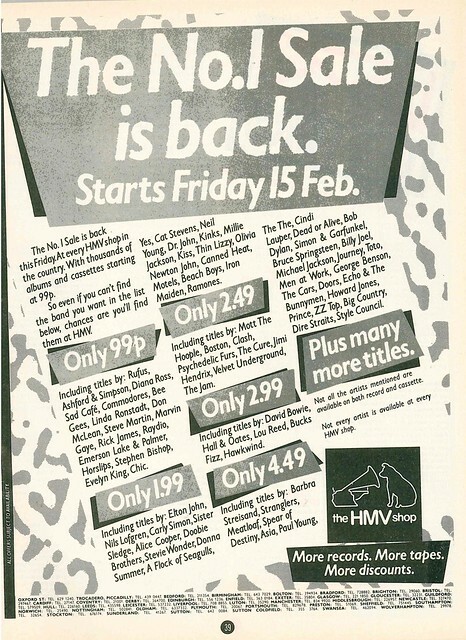 On the theme of Neil Diamond covers, here’s another one, by a man who shares a birthday with him (1959) ……… Mr Victor Reeves, performing with EMF in 1995. 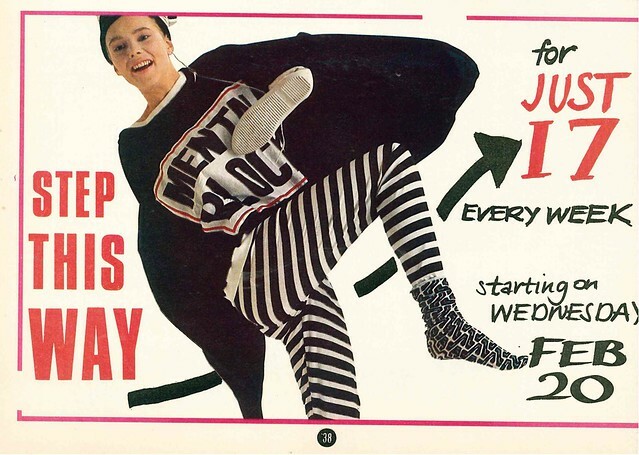 Of course, it would be rude to mention Vic Reeves, and not include his collaboration with The Wonder Stuff. 58 this week, Andy Cox was a two time (or three time, if you include Two Men and a Drum Machine) pop star in the 1980s, with The Beat and Fine Young Cannibals. So, in the interest of fair play, here’s one of each. Another famous Andrew in pop, is Mr Andrew Ridgeley off of Wham! This song, is just superb. Seeing as birthdays of New Order members will be commemorated with side projects such as Electronic or Monaco, how about an actual New Order song for Gillian Gilbert. They probably should have just mimed. Meanwhile it’s Mark Owen’s birthday this week, so here he his performing Never Forget, in an episode seemingly presented by Howard Donald’s future other half Catherine Tate. Frank Skinner celebrates a birthday this week. I imagine you’ve guessed what video is coming up next. Sadly, it’s the awful 1998 version rather than the excellent 1996 one. Matthew Wilder also celebrates a birthday this week. Here he is being enthusiastically introduced by John Peel. He ended up helping No Doubt become massive in the late 90s. And finally, this week sees Australia Day, so here’s a couple of tunes from Down Under for you. And finally, the song that soundtracked Australia’s Royal Wedding. I still get emotional thinking about it. Scott and Charlene. What a lovely couple.